Sunrisers Hyderabad (SRH) will lock horns with Kings XI Punjab (KXIP) in the match no 22 of VIVO Indian Premier League (IPL), 2019. The match will take place at Punjab's home ground I S Bindra Stadium, Mohali. 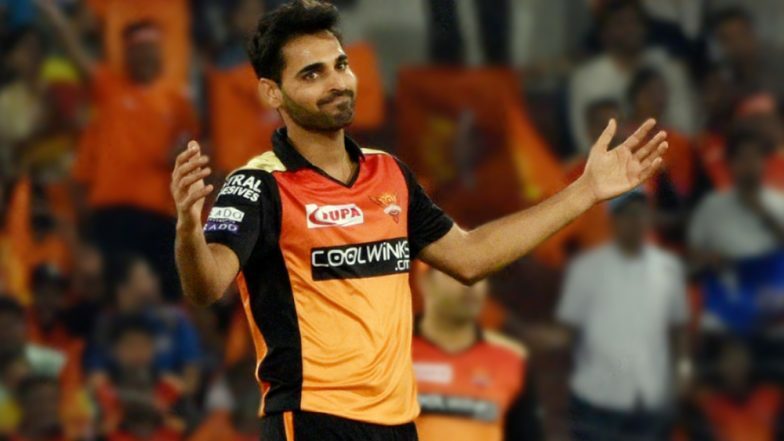 Ahead of KXIP vs SRH, Hyderabad shares stats of their bowler Bhuvneshwar Kumar, who might reach 100 wickets while playing for the orange army. KXIP vs SRH Head-to-Head Record: Ahead of IPL 2019 Clash, Here Are Match Results of Last 5 Kings XI Punjab vs Sunrisers Hyderabad Encounters! Both SRH and KXIP has earned 6 points so far in IPL 2019. KXIP lost their last match against Chennai Super Kings (CSK), while SRH faced defeat from Mumbai Indians (MI) in their previous game. The right-arm medium bowler Bhuvneshwar Kumar has been leading the men in orange so far, as Kane Williamson is still recovering from his shoulder injury. We are not sure like who will lead the orange army in their upcoming game against KXIP. KXIP vs SRH, IPL 2019 Match 22, Key Players: David Warner to R Ashwin to KL Rahul, These Cricketers Are to Watch Out for at PCA Stadium. Speaking about SRH bowling performance till now in IPL 2019, their star bowlers from previous season like Rashid Khan and Bhuvi are not sparkling they way they did in IPL 11. Also if Hyderabad wants to perform well in the coming matches, they will have to work on their fielding. We saw Rashid and Mohammad Nabi putting down MI batsman Kieron Pollard's catch in SRH vs MI. Their sloppy fielding helped Mumbai post a total of 136. Also, SRH batsman like Manish Pandey, Deepak Hooda, Yusuf Pathan and Vijay Shankar should play a part in batting as SRH is relying too much on the pair of David Warner and Jonny Bairstow. It will be interesting to see the battle between Chris Gayle and Rashid Khan in tonight's KXIP vs SRH.